There are a number of golf courses of various quality and size in Mazatlán. The golf courses are more for tourists and foreign residents of Mazatlán, but there is one local city course. We are going to attempt to tell you all about golfing in Mazatlán and all about the Mazatlán Golf Courses. There is also a new driving range, Pacific Golf Centre and Driving Range. Mazatlán usually hosts a tournament of the Latin American PGA Tour each year. In January 2017, the Estrella del Mar Golf course was the location for a PTLA Qualifying Tournament. The Estrella Del Mar golf course is located in the Estrella Del Mar golf condo and beach resort development. This is near the Mazatlán Airport which is about a 30 minute drive from the tourist area in Mazatlán The course was designed by reknown golf course designer Robert Trent Jones Jr.. It is an 18 hole, par 72, 5959-7015 yards championship golf course right on the ocean! The El Cid golf course is the established golf course in the Golden Zone. It is actually three 9 hole golf courses: Marina, Moro, and Castilla. The Marina Course is a 9 hole, par 36 hole, 2243-3457 yard course. This course was designed by golf legend Lee Trevino. The Moro Course is a 9 hole, par 36 hole, 2352-3423 yard course. This is a more challenging course. The 8th hole is called the 'Monster' and is a 611 yard par 5 hole! The Castilla Course is a 9 hole, par 36 hole, 2230-3200 yard course. This is a more forgiving 9 holes. Caddie Fees: There are caddies available for about US$20. Green Fees: elcidgolfclub.com/green-fees/ The El Cid offers many different packages. Check their website for details. 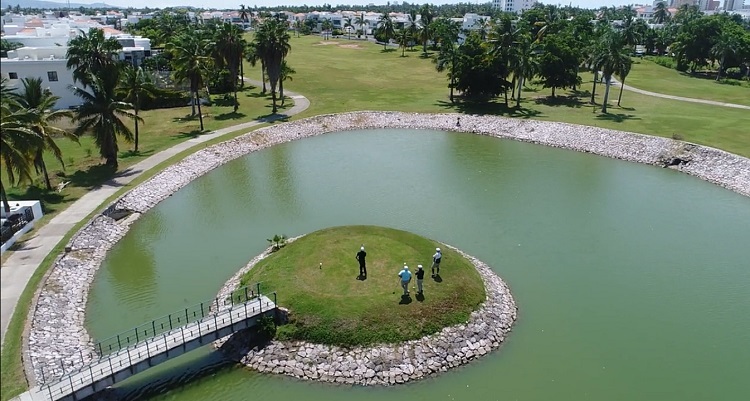 The Marina Mazatlán Golf course is the newest golf course in Mazatlán. It is an 18 hole, par 72, ?? ?yard golf course designed by well known designer David Fleming. This is a 9 hole, par ?, ? yard city golf course. It is an older golf course. No golf cart are available at this course, but caddies are available. This is the least expensive course to play in Mazatlán. It is located behind the port in residential areas. The Pacific Food Truck Park and Golf is a driving range located in the Marina Mazatlán area of Mazatlán. It also has batting cages and a sports bar called Mulligan's.